Driving around Clermont isn’t short on road hazards that can put a nail in your afternoon, or in your tire. With all the construction around Orlando and road debris aplenty, you could be cruising down the road and before you know it your tire pressure lights are coming on and you’re pulling over onto the shoulder in a panic. Luckily, with comprehensive vehicle insurance you can call a tow truck or roadside assistance to give you a hand and fix the problem. But what if you’re in a rush or can’t get ahold of a service provider? Changing a flat tire on your own can seem intimidating, but it’s actually a very straightforward procedure and you’re given all the tools you need with your new vehicle. 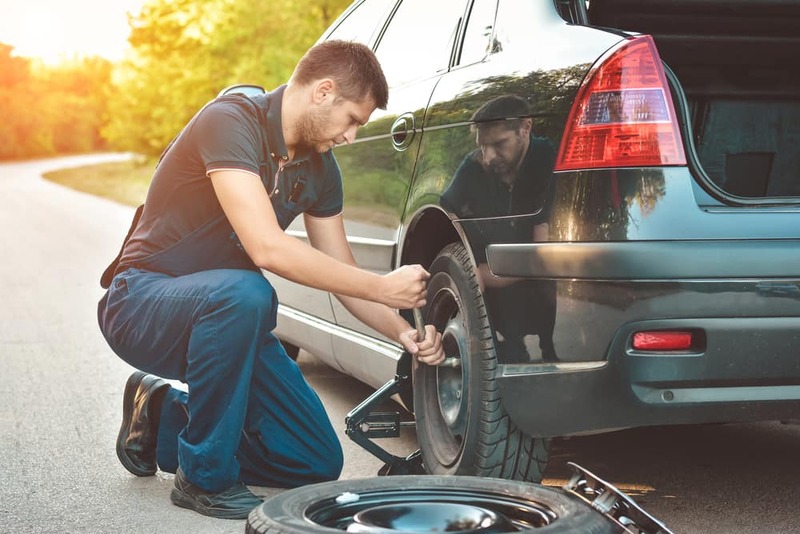 If you’ve been forced to pull over due to a flat tire, the first thing you should do is make sure you have all the necessary tools needed for a replacement. To replace a damaged tire, you’ll need a spare tire, jack, and a lug wrench that matches the lug nuts on your wheels. It also doesn’t hurt to have a towel or a mat to make the procedure more comfortable or a flashlight in case you need to replace your tire in the dark. After you realize that you have a flat tire, make sure to begin pulling over as quickly as you can to avoid any further damage. Make sure you bring your Clermont Toyota vehicle to a safe spot that’s out of the way of oncoming traffic. When pulled over in an emergency, you should always activate your hazard lights to warn other drivers that you’re there. Your jack is there to raise your Clermont Toyota vehicle. But, before you start cranking away, make sure to consult your owner’s manual to get the placement right. After your vehicle has been elevated to the right height, it’s time to use your lug wrench to remove the lug nuts and the tire. Before you start, pull the e-brake in your car to avoid the vehicle rolling back if you’re on an angled surface. Before you mount the spare tire, make sure to check the tire pressure and make sure it’s at the proper level (usually anywhere from 40 – 55 psi). When mounting the tire, make sure to place and tighten the lug nuts sequentially in a clock-wise fashion. After you’ve finished replacing your spare tire, lower your vehicle and put all your parts back. Remember, your spare tire is only meant to drive for a short time until you can replace it with your original tire. If you need a reliable and fairly priced auto service garage to fix your tire, then come down to Toyota of Clermont! We’ll get your flat tire fixed at an affordable price and get you back on the road. We’re located at 16851 State Road 50 and open seven days a week!